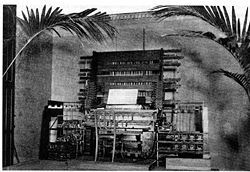 Telharmonium console by Thaddeus Cahill in 1897. Electronic music is a term for music created using electronic devices. As defined by the IEEE (Institute of Electrical and Electronics Engineers) standards body, electronic devices are low-power systems and use components such as transistors and integrated circuits. Working from this definition, distinction can be made between instruments that produce sound through electromechanical means as opposed to instruments that produce sound using electronic components. Examples of an electromechanical instrument are the teleharmonium, Hammond B3, and the electric guitar, whereas examples of an electronic instrument are a Theremin, synthesizer, and a computer. 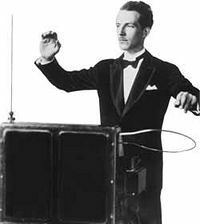 Leon Theremin playing his invention, the Theremin. Before electronic music, there was a growing desire for composers to use emerging technologies for musical purposes. Several instruments were created that employed electromechanical designs and they paved the way for the later emergence of electronic instruments. An electromechanical instrument called the Teleharmonium (or Telharmonium) was developed by Thaddeus Cahill in 1897. Simple inconvenience hindered the adoption of the Teleharmonium: The instrument weighed seven tons and was the size of a boxcar. Several more refined versions were also constructed a few years later (the final and most refined model arriving in 1907, weighing in at 200 tons). The first electronic instrument is often viewed to be the Theremin, invented by Professor Leon Theremin around 1919-1920. Another early electronic instrument was the Ondes Martenot, which was used in the Turangalîla-Symphonie by Olivier Messiaen and also by other, primarily French, composers such as Andre Jolivet. The tape recorder was invented in Germany during World War II. It wasn't long before composers used the tape recorder to develop a new technique for composition called Musique concrète. This technique involved editing together recorded fragments of natural and industrial sounds. 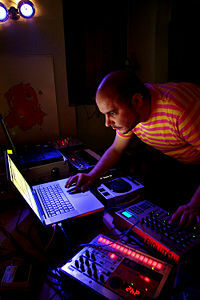 Frequently, composers used sounds that were produced entirely by electronic devices not designed for a musical purpose. The first pieces of musique concrète were written by Pierre Schaeffer, who later worked alongside such avant-garde classical composers as Pierre Henry, Pierre Boulez, and Karlheinz Stockhausen. Stockhausen has worked for many years as part of Cologne's Studio for Electronic Music combining electronically generated sounds with conventional orchestras. 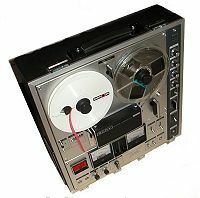 The first electronic music for magnetic tape composed in America was completed by Louis and Bebe Barron in 1950. Two new electronic instruments made their debut in 1957. Unlike the earlier Theremin and Ondes Martenot, these instruments were hard to use, required extensive programming, and neither could be played in real time. The first of these electronic instruments was the computer, when Max Mathews used a program called Music 1, and later Music 2, to create original compositions at Bell Laboratories. CSIRAC in Australia was a computer which played music in real time much earlier than this (1950 or 1951) and it was similarly difficult to program, but musical developments stalled and it was not used to develop new computer music, instead playing popular tunes. Other well-known composers using computers at the time include Edgard Varèse, and Iannis Xenakis. The other electronic instrument that appeared that year was the first electronic synthesizer. Called the RCA Mark II Sound Synthesizer, it used vacuum tube oscillators and incorporated the first electronic music sequencer. It was designed by RCA and installed at the Columbia-Princeton Electronic Music Center, where it remains to this day. The Columbia-Princeton Electronic Music Center, now known as the Computer Music Center, is the oldest center for electronic and computer music research in the United States. It was founded in 1958, by Vladimir Ussachevsky and Otto Luening who had been working with magnetic tape manipulation since the early 1950s. A studio was built there with the help of engineer Peter Mauzey and it became the hub of American electronic music production until about 1980. Robert Moog developed voltage controlled oscillators and envelope generators while there, and these were later used as the heart of the Moog synthesizer. Our idea was to build the black box that would be a palette for composers in their homes. It would be their studio. The idea was to design it so that it was like an analog computer. It was not a musical instrument but it was modular…It was a collection of modules of voltage-controlled envelope generators and it had sequencers in it right off the bat…It was a collection of modules that you would put together. There were no two systems the same until CBS bought it…Our goal was that it should be under $400 for the entire instrument and we came very close. That's why the original instrument I fundraised for was under $500. In the late 1960s, Wendy Carlos popularized early synthesizer music with two notable albums, Switched-On Bach and The Well-Tempered Synthesizer, which took pieces of baroque classical music and reproduced them on Moog synthesizers. The Moog generated only a single note at a time, so that producing a multilayered piece, such as Carlos did, required many hours of studio time. The early machines were notoriously unstable, and went out of tune easily. Still, some musicians, notably Keith Emerson of Emerson Lake and Palmer did take them on the road. The theremin, an exceedingly difficult instrument to play, was even used in some popular music. Many people believe it to be used in "Good Vibrations" by The Beach Boys, however, the instrument used was actually an Electro-Theremin. There was also the Mellotron which appeared in the Beatles' "Strawberry Fields Forever," and the volume tone pedal was uniquely used as a backing instrument in "Yes It Is." As technology developed, and synthesizers became cheaper, more robust, and portable, they were adopted by many rock bands. Examples of relatively early adopters in this field are bands like The United States of America, The Silver Apples, and Pink Floyd, and although not all of their music was electronic (with the exception of The Silver Apples), much of the resulting sound was dependent upon the synthesizer, although it usually merely substituted for an organ. In the 1970s, the electronic style was revolutionized by the Düsseldorf band Kraftwerk, who used electronics and robotics to symbolize, and sometimes gleefully celebrate, the alienation of the modern technological world. To this day their music remains uncompromisingly electronic. In Germany, particularly, electronic sounds were incorporated into popular music by bands such as Tangerine Dream, Can, Popol Vuh, and others. Some of the leading jazz pianists, most notably Herbie Hancock, Chick Corea, Joe Zawinul (Weather Report), and Jan Hammer (Mahavishnu Orchestra), started to use synthesizers on their fusion recordings during the years of 1972-1974. The very first fusion albums containing synthesizer were recorded in 1972. These recordings, I Sing the Body Electric by Weather Report and Crossings by Herbie Hancock, used synthesizer for sound effects rather than a replacement for piano (and actually neither Hancock nor Zawinul played the synthesizer on those albums themselves). But in 1973, the synthesizer—used now as a solo instrument—was already part of the jazz fusion sound as heard in Weather Report's Sweetnighter album and Hancock's famous The Headhunters. Corea and Hammer soon followed, and both developed unique ways of playing synthesizers—utilizing slide, vibrato, ring modulators, distortion, and wahwah. Later, Hancock released the well known Future Shock album, a collaboration with producer Bill Laswell in the 1980s, which spawned a pop hit, "Rockit," in 1983. Musicians such as Tangerine Dream, Klaus Schulze, Brian Eno, Vangelis, Mike Oldfield, Jean-Michel Jarre, Ray Buttigieg, as well as the Japanese composers Isao Tomita and Kitaro, also popularized the sound of electronic music. The film industry also began to make extensive use of electronic music in soundtracks. An example is the Wendy Carlos' score for A Clockwork Orange, Stanley Kubrick's film of the Anthony Burgess novel. The score for Forbidden Planet, by Louis and Bebe Barron, was entirely composed using the Theremin in 1956. Once electronic sounds became more common in popular recordings, other science fiction films, such as Blade Runner and the Alien series of movies began to depend heavily for mood and ambience upon the use of electronic music and electronically derived effects. Electronic groups were also hired to produce entire soundtracks, just like other popular music stars. In the late 1970s and early 1980s there was a great deal of innovation around the development of electronic music instruments. Analogue synthesizers largely gave way to digital synthesizers and samplers. Early samplers, like early synthesizers, were large and expensive pieces of gear. Companies like Fairlight and New England Digital sold instruments that cost upwards of $100,000. In the mid 1980s, however, the introduction of low-cost digital samplers made the technology available to more musicians. From the late 1970s onward, much popular music was developed on these digital machines. Groups and artists such as Ultravox, Gary Numan, The Human League, Landscape, Visage, Daniel Miller, Pete Shelley, Heaven 17, Eurythmics, Severed Heads, John Foxx, Thomas Dolby, Orchestral Manoeuvres in the Dark, Norman Iceberg, Yazoo, Art of Noise, Yello, Depeche Mode, and New Order developed new ways of making popular music by electronic means. Fad Gadget (Frank Tovey) is cited by some as the father of electronics in New Wave, although Ultravox, The Normal (Daniel Miller), The Human League, and Cabaret Voltaire, all released electronic singles before Fad Gadget. The new kinds of electonic noise that synthesizers could create contributed to the formation of the genre of industrial music, pioneered by groups such as Throbbing Gristle, in 1975, Wavestar, and Cabaret Voltaire. Artists like Nine Inch Nails in 1989, KMFDM, and Severed Heads, took the innovations of musique concrète and applied them to dance and rock music. Others, such as Test Department, Einstürzende Neubauten, took this new sound and created noisy electronic compositions. Other groups, such as Robert Rich, Zoviet France, and Rapoon created soundscapes using synthesized noise. Still others (Front 242, Skinny Puppy) combined this harshness with pop and dance, creating electronic body music. During this time, dub musicians such as industrial-funk outfit Tackhead, vocalist Mark Stewart, and others on Adrian Sherwood's On-U Sound record label in the 1980s integrated the aesthetics of industrial and noise music with tape and dub production. This paved the way for much of the 1990s interest in dub, first through bands such as Meat Beat Manifesto and later downtempo and trip hop producers such as Kruder & Dorfmeister. The development of the techno sound in Detroit, Michigan, and house music in Chicago, Illinois, in the 1980s, and the later UK-based acid house movement of the late 1980s and early 1990s fueled the development and acceptance of electronic music into the mainstream and introduced electronic dance music to nightclubs. Electronic composition can create faster and more precise rhythms than is possible using traditional percussion. The sound of electronic dance music often features electronically altered sounds (samples) of traditional instruments and vocals. Electronic music, especially in the late 1990s fractured into many genres, styles and sub-styles, too many to list here, and most of which are included in the main list. Although there are no hard and fast boundaries, broadly speaking we can identify the experimental and classical styles: Electronic art music, musique concrète; the industrial music and synth pop styles of the 1980s; styles that are primarily intended for dance such as italo disco, techno, house, trance, electro, breakbeat, jungle, drum and bass, and styles that are intended more as experimental styles or for home listening such as IDM, glitch, and trip-hop. The proliferation of personal computers and the MIDI interface beginning in the 1980s, brought about a new genre of electronic music, known loosely as chip music or bitpop. These styles, produced initially using specialized sound chips in PCs such as the Commodore 64, Commodore Amiga, and Atari ST among others, grew primarily out of the demoscene. The latter categories such as IDM, glitch and chip music share much in common with the art and musique concrète styles which predate it by several decades. With the explosive growth of computers music technology and consequent reduction in the cost of equipment in the late 1990s, the number of artists and DJs working within electronic music is overwhelming. With the advent of hard disk recording systems, it is possible for any home computer user to become a musician, and hence the rise in the number of "bedroom bands," often consisting of a single person. Nevertheless, notable artists can still be identified. Within the experimental and classical or "art" traditions still working today are Karlheinz Stockhausen, Pierre Boulez, and Steve Reich. The genre of cosmic electronic music was formed at the turn of the 1970s, in Germany, by Popol Vuh, Klaus Schulze, and Tangerine Dream. Influential musicians in industrial and later synth pop styles include Throbbing Gristle(who reformed in 2004), Cabaret Voltaire (now defunct), the Human League, and Kraftwerk who released their first album in over a decade in 2003. In house, techno, and drum and bass pioneers such as Juan Atkins, Derrick May, Goldie, A Guy Called Gerald and LTJ Bukem are still active as of 2006. Commercially successful artists working under the "electronica" rubric, such as Fatboy Slim, Faithless, Fluke, The Chemical Brothers, Daft Punk, The Crystal Method, Massive Attack, The Prodigy, Orbital, Propellerheads, Underworld, Björk, and Moby, continue to release albums and perform regularly (sometimes in stadium-sized arenas, such has the popularity of electronic dance music grown). Some DJs such as Paul Oakenfold, John Digweed, Paul van Dyk, Armin van Buuren, Ferry Corsten, and Tiësto) have reached true superstar status and can command five-figure salaries for a single performance. They perform for hours on end mixing their music into pre-recorded singles. Some DJs have world wide Radio, and internet, broadcast shows that air weekly, such as A State Of Trance, a show mixed by Armin van Buuren. The critically acclaimed Autechre and Aphex Twin continue to put out challenging records of (mostly) home-listening music. Until 1978, and the formation of Mute Records, there were virtually no record labels that deal with exclusively electronic music. Because of this dearth of outlets, many of the early techno pioneers started their own. For example, Juan Atkins started Metroplex Records, a Detroit-based label, and Richie Hawtin and John Acquaviva started their hugely influential Plus 8 imprint. In the United Kingdom, Warp Records emerged in the 1990s as one of the preeminent sources of home-listening and experimental music. Later arrivals include Astralwerks, Ninja Tune, Tiesto's Black Hole Recordings, and Oakenfold's Perfecto Record label. United States magazine sources include the Los Angeles based Urb, BPM Magazine, and San Francisco-based XLR8R, and other magazines such as Side-Line, e/i, and Grooves. British electronic music sources include the London-based magazine The Wire (a monthly publication), DJ, Mixmag, Knowledge, Sound on Sound, Computer Music, Music Tech Magazine, and Future Music. German magazine sources include Spex as well as Berlin-based De:bug. Bogdanov, Vladimir, Chris Woodstra, Stephen Thomas Erlewine, and John Bush (eds.). All Music Guide to Electronica: The Definitive Guide to Electronic Music. Backbeat Books, 2001. ISBN 0-879-30628-9. Kettlewell, Ben. Electronic Music Pioneers. ArtistPro.com, 2001. ISBN 1-931140-17-0. Lee, Iara and Peter Shapiro (eds.). Modulations: A History of Electronic Music: Throbbing Words on Sound. Distributed Art Publishers, 2000. ISBN 1-891-02406-X. Prendergast, Mark. The Ambient Century: From Mahler to Trance: The Evolution of Sound in the Electronic Age. Bloomsbury, 2001. ISBN 0-747-54213-9. Reynolds, Simon. Energy Flash: a Journey Through Rave Music and Dance Culture. UK: Pan Macmillan, 1998. ISBN 0-330-35056-0. Schaefer, John. New Sounds: A Listener's Guide to New Music. HarperCollins, 1987. ISBN 0-060-97081-2. Sicko, Dan. Techno Rebels: The Renegades of Electronic Funk. Billboard Books, 1999. ISBN 0-823-08428-0. All links retrieved September 15, 2017.
pHinnWeb/history - Long list of links relating to electronic music history. Notes on Paul Bley and the A P S.
This page was last modified on 15 September 2017, at 19:17.